One billion people (yes, ONE BILLION!) on the planet are working together in cooperatives of all kinds. This is a staggering statistic – one that the United Nations recently released as part of the rationale for its declaration making 2012 “the year of the cooperative.” While the United Nations could not be considered a revolutionary organization, this declaration could end up being a revolutionary act. The declaration has focused many eyes of all shapes and colors on cooperatives, cooperation and the cooperative way of doing business, living life and conducting our social affairs – a way that values people and the planet, and that has the potential for eradicating hunger, poverty, alienation and isolation, and bringing peace, justice, joy and prosperity to the entire Earth. As cooperators, we gain heart knowing that whether we are sewing handbags in Alabama, baking bread in the San Francisco Bay Area, or creating technological solutions in Madison, WI that we are working in solidarity with our cooperative counterparts in Albania, Nigeria and the Philippines. We are an integral part of a larger planetary movement full of dynamic potential to usher in a more humane world. We cooperators are part of the 99% working every day to foster democracy, creativity and cooperative human values in our workplaces, in our communities and elsewhere in our lives. In “The Power of Cooperation,” we learn that the number of people who are members of cooperatives are three times that of corporate shareholders. In three countries, we learn that more than half the population are members of cooperatives. As Charles Gould of the International Co-Operative Alliance, writes in his article, “2012 – Not Business As Usual,” we are living and working in a critical time. How we respond and what we do at this point is pivotal to continued economic evolution. encourage governments and regulatory bodies to establish policies, laws and regulation conductive and forming and growing cooperatives. A goal of the U.N. declaration is to promote policy change on a global level toward cooperatives. Peter Frank writes in “Will the U.S. Government Legislate Cooperative Development?” about an initiative in the U.S. Congress on the National Cooperative Development Act that would help the U.S. become more like Canada where the government has been supporting cooperative development for since the 1990s. Micha Josephy, of the Cooperative Fund of New England, writes in “SBA Recognizes Worker Cooperatives as Small Businesses” about the Small Business Association making it possible for CFNE to give six worker cooperatives their first loans. Josephy also explains now others may take advantage of this historical development. 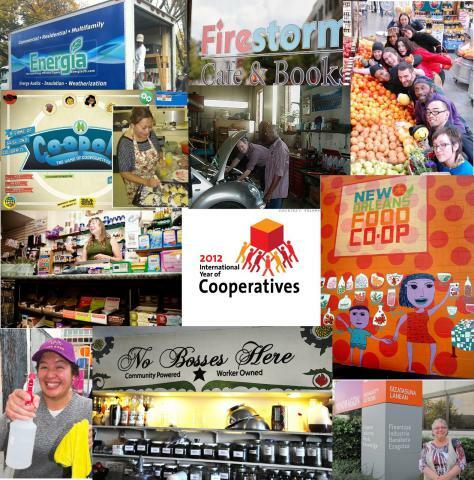 We also report in “International Year of the Cooperative Inspirations” three short examples of what the IYC has inspired in two cooperatives, and one individual so far this year. We hope these examples spark more ideas and ways to expand cooperation. We hope to run more of these throughout the year so send them to us at editor@geo.coop. Immanuel Ness, in the article “Cooperatives and Worker-Owned Enterprises as Transformative Strategies,” reports on a conference at the Rosa Luxemburg Institute in Germany where scholars debated whether the time is ripe for a mass conversion of traditional business into worker cooperatives. Also included in this issue are articles about cooperation in a social context. In Italy, a wonderful “slow revolution” is taking place where people have been changing society using cooperation. Economics professor and human geographer Alberto Corbino, in his article “Italy’s Slow Revolution: A Twist on Solidarity Economics” reports on this movement, which has had success in using Mafia money for the common good. GEO’s Michael Johnson writes about “Cooperative Principles and the Common Good.” This article came about after a discussion with Terry Mollner, founder of the Trusteeship Institute in Shutesbury, MA about his ideas around the common good. Finally, we include a list of IYC Activities and a short list of Resources that will hopefully help to nurture growth and development of cooperatives this year. Hopefully the momentum of this year, will leap, as Gould projects, enough so that the International Year of Cooperatives leads to the Decade of the Cooperative and moving us swiftly into a Cooperative Planet. 2012 was ushered in with the Occupy Movement and it the year when the prophecies state there will be great changes on the planet. While some of these are cosmic, let cooperatives and cooperation be a foundational part of that change to the billions occupying the planet. Nature is cooperative. Why shouldn’t we be? Christina A. Clamp and Ajowa Nzinga Ifateyo, issue co-coordinators. Thanks to Tom Pierson of the North American Students of Cooperation for help with a list of activities International Year of the Cooperative and National Cooperative Business Association’s Andrea R. Cumpston , and new GEO Associate Marty Heyman help with putting together the list, as well as editing and posting Gleanings and calendar items. Anonymous, whose passion or cooperatives has been an inspiration to many is also very much appreciated. In addition, thanks to the following for photos on short notice: Hazel Corcoran and David Wilson of the Canadian Worker Co-op Federation;, Jennifer Stocker and Yilda Campos of Rainbow Grocery Cooperative; Joe Rinehart at Firestorm Café; Elena Fairley at Women’s Action to Gain Economic Security or WAGES; Ann St. James, Collective Copies; Vanessa Bransburg at Center for Family Life; Sarah Brobow-Willams at Southern Black Women’s Initiative; Lori Burge at the New Orleans Food Co-op, Ole Olson at Isthmus Engineering; and Marilyn Langlois of Mayor Gayle McLaughlin’s Office in Richmond, CA, and Lexi Hudson, California Center for Cooperative Development. It was indeed a cooperative effort.